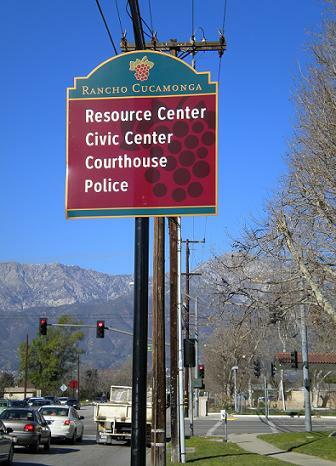 Rancho Cucamonga has some nifty new-ish directional signs around town (see below). But the other day I was startled to notice one that’s missing all its arrows. Ironically, it’s near Arrow on Archibald. Just drive aimlessly, citizens; you’ll find the Police eventually. The sign on Milliken Avenue near the 210 Freeway could be helpful to someone trying to find a meeting at the Community or Senior Center. 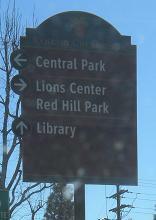 Except the sign only says “Central Park.” They’re very nicely done. Too bad they don’t help much! How much did they cost the city? I find it ironic that the city has no problem putting up signs to show people how to get to sites within the city, but the same city has tougher sign restrictions on businesses that provide tax revenue for the city that help pay for these signs!